Marking a five-day winning streak, the benchmark Nikkei 225 index added 0.25 percent or 56.31 points at 22,277.97, while the broader Topix index ended up 0.26 percent or 4.22 points at 1,630.68. The Nikkei started the day higher but soon dipped into negative territory as investors searched for fresh cues. But the index rebounded by late morning as investors cheered fresh Chinese indicators that confirmed, as expected, Asia's top economy grew 6.4 percent during the January-March quarter compared to a year ago. 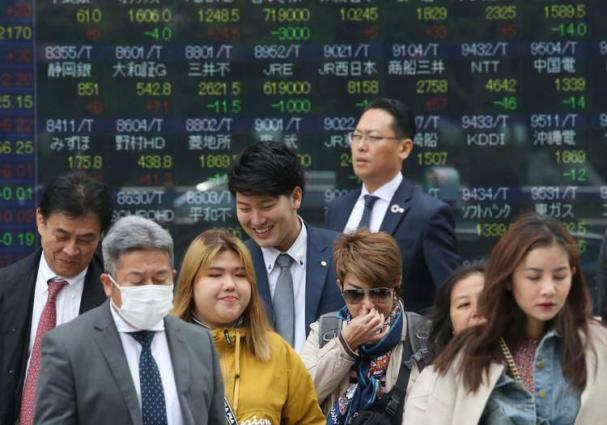 "Once the bright Chinese indicators came out, bargain hunters came in and lifted the Nikkei to the day's high" of 22,345.19, Okasan Online Securities said in a commentary. "The data further solidified optimism that the Chinese economy was bottoming out, which in turn provided strong support for the Tokyo market. Even after five days of gains, the market is not showing a sense of overheating," Okasan added. Solid US shares overnight as well as a relatively weaker Yen also lifted the Tokyo market, analysts said. The Dollar was at 111.96 yen, little changed from 112.00 yen in New York late Tuesday. Among major Tokyo shares, construction equipment maker Komatsu, which benefits from a strong Chinese economy, added 1.94 percent to 2,835.5 yen. Toyota surged 2.02 percent to 6,953 yen, while Honda added 1.02 percent to 3,170 yen. Sony gained 0.17 percent to 5,363 yen. Nintendo rose 1.07 percent to 34,830 yen. Uniqlo operator Fast Retailing rose 0.92 percent to 62,400 yen. Advantest, which makes chip-testing tools, jumped 5.48 percent to 3,270.